NOTE: This solution comes with several limitations, which I discuss in the last section of the article. In an internet browser access your Exchange admin center (typically it will be available under: https://<CASServerName>/ecp or https://mail.contoso.com/ecp) using Transport Rules administrator credentials. * This is a minor shortcut. 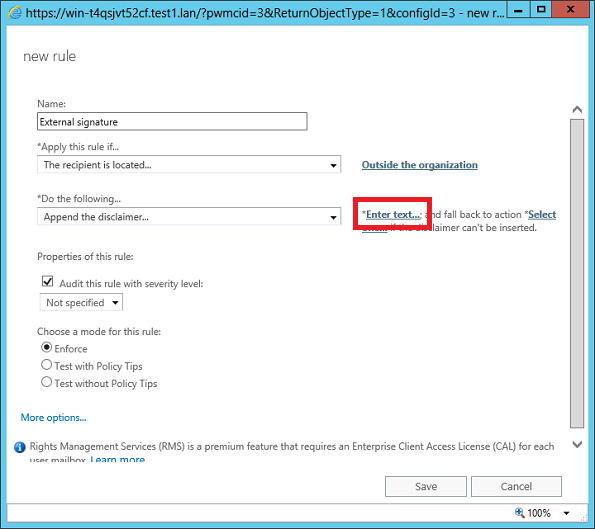 If you select Create a new rule…, you will have to navigate to manually select the Apply disclaimers action in the subsequent new rule window, that’s all. Regardless which option you choose, the the new rule window always gives you the option to change the action to another one. Type in a name of your signature rule (in the example below it’s “External signature”) and in the *Apply this rule if… section select the condition you want emails to meet to trigger the rule. Since I want the signature added to all emails going out to external contacts, I’ll go with The recipient is located… and in the resulting window select Outside the organization. NOTE: If you want to add more conditions or exceptions, click More options… at the bottom of the new rule window. In the resulting specify disclaimer text window provide your email signature text or HTML code. Keep in mind that you can use Exchange mailbox variables formatted this way: %%[name of variable]%%. 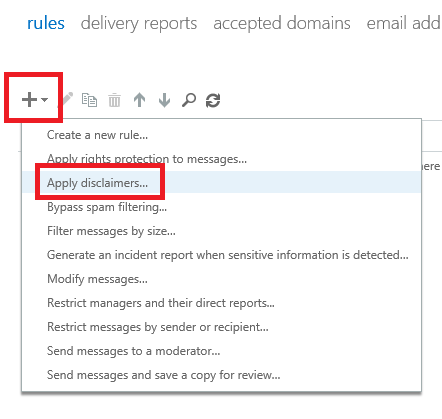 After saving the disclaimer text, click Select one… and decide what action should be taken if a message cannot be processed by the rule (this can happen when the email is e.g. encrypted). 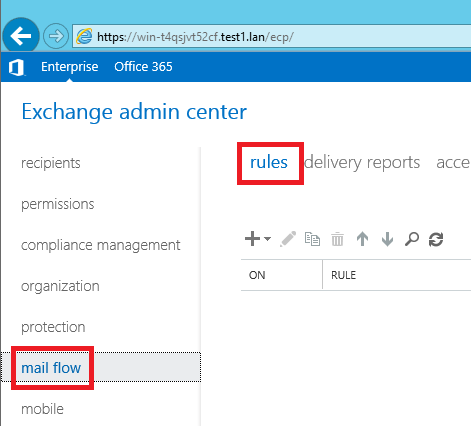 Wrap – The original message is added as an attachment to a new email, which is then processed by the rule. Ignore – The original message is sent to the recipient without being processed. Reject – The original message is rejected. Enforce – The rule is active upon saving. 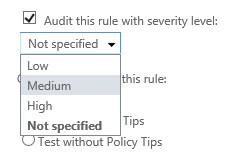 Test without Policy Tips – The rule is not active upon saving. 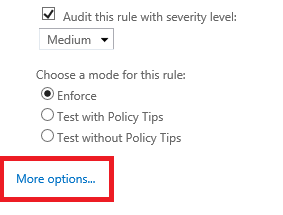 Note that, to actually be able to test it, you will need to add the Generate incident report… action to your rule (learn more about adding multiple actions to rules). Click Save in the lower-right corner of the window and test your rule. Having done this, you will notice that you are now able to add more than one condition, action and exception to your rule. and provide comments for the rule. Using other Active Directory variables than the ones corresponding with the variables I listed above. 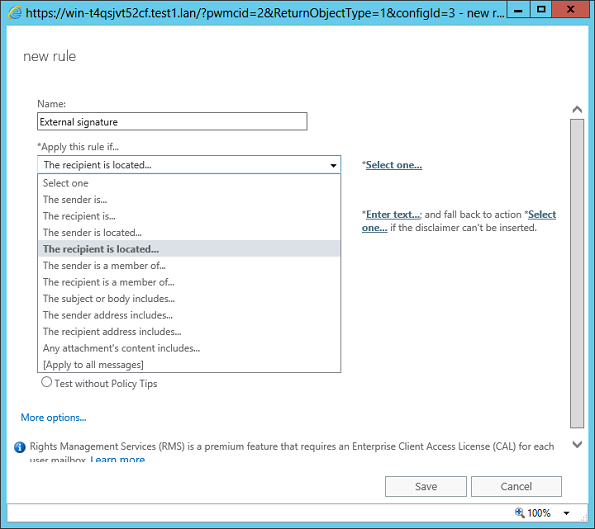 To be able to overcome these limitations, as well as enjoy features such as limited remote access to email signature rules and a WYSIWYG HTML template editor, use CodeTwo Exchange Rules 2016. 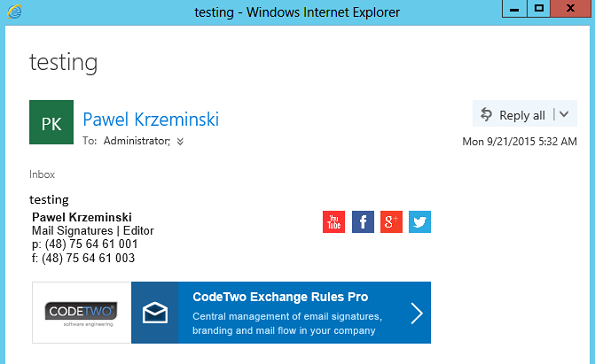 This entry was posted in Microsoft Exchange Server 2016 and tagged exchange 2016, hub transport rules, organization-wide email signatures, transport rules on September 23, 2015 by Adam the 32-bit Aardvark. You can experiment with exceptions so that no emails sent to Planner groups will have a signature added. To add the exception, click the more options button and select if the recipient is the planner group. Will this apply to emails that allready have the signature applied upon replies? I`ve sometime seen that at the bottom of some emails, there is the same signature repeted for each time the email have been replied to and gone back and forth…. Yes, by default, the rule applies to all messages, including replies and forwards. This often causes the signatures to stack up at the bottom of conversation. A workaround for that is to add an exception to the rule so that the signature is not added when its fragment is already found in an email. If you are looking for a solution which makes server-sided email signatures appear directly below each reply & forward, you need a third-party tool, like CodeTwo Exchange Rules. What is the html script used for replies / forwards for signature or how do i set it for replies and forwards – i don’t get a signature if i try to replay or forward a mail to others. By default, the native server-sided email signature is added to each email, including replies and forwards. The problem is that the signature is added at the bottom of the conversation. To add a server-sided email signature directly below replies and forwards, you can use a third-party tool, CodeTwo Exchange Rules. is there no other way through exchange that it can happen – without purchasing the license. Although there are some limitations to the native server-sided email signatures, some companies still use it. Fully-functional server-sided email signatures; however, require a third-party tool like the one I have mentioned. 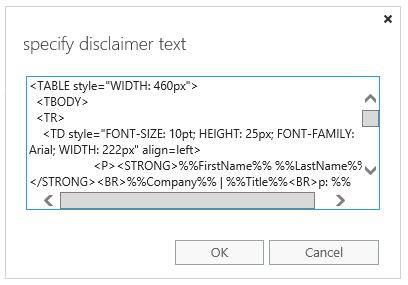 “The disclaimer text contains an invalid macro name: ‘%%First Name%%’. Can someone help me please to overcome this issue? This error is probably caused by the wrong placeholder. AD placeholders have no spaces in them. Try changing %%First Name%% to %%FirstName%% and review other placeholders in your signature design. The invalid macro name error appears whenever a wrong placeholder is used inside the disclaimer. You could make the task easier by using our free email signature generator. One of its features is to automatically insert the right AD placeholders into the disclaimer.